The up and coming popular product for knife making are belt sanders. The main reason this product is trending is that it when used it creates a convex edge that removes less metal. Convex edges increase the durability of the knife as the convex edges have more supportive parts of steel, so it stays sharper for longer periods. 2 inches wide x 72 inches belt sander are the most recommended knife making belt sander machines. The longer and wider a belt is the more uses you are going to get out of it over time. With any rotating tool, you must put enough pressure on the knife blade against the surface of the tool to avoid shattering and random dangerous movement. First basic principal is to hold the work piece with a two-hand grip supporting the blade firmly and keep elbows tight to your body. By placing enough pressure with your body, not your fingers, it will allow you to maintain clean grind lines and will be easier to control. Controlling of the sander movement mainly with your body to slide across the belt. With shorter knives, you can put your thumb behind it for extra control. A good tip, if you don’t conveniently have heat resistant work gloves, you can put tape around your thumbs and fingers to keep the heat from burning your hands because a lot of heat is generated from the belt, no matter how new the belt it. You will also want to work in two directions, sliding side-to-side, using left and right hands skills. The more you develop the skill to grind from both sides while flipping the knife over, the easier knife making will be. It is important to work fluently with both hands paying special attention to controlling your weaker hand. Make sure to have a big bucket of water handy close by to cool off your work. As great heat is produced you must constantly dip your knife into the bucket of water every time it starts to get to hot. Some belt sanders come with a handy table feature that is adjustable, usually front to back, so you are able to give you more support to control the knife and get it tight to the belt more easily. Various fixtures and distinctive designs can be put on the knife easier and you can sand the knife at a 90 degree angle as well when using the very helpful feature of the adjustable table. This is recommended to beginners or people who don’t have steady hands or a developed technique or experience yet. 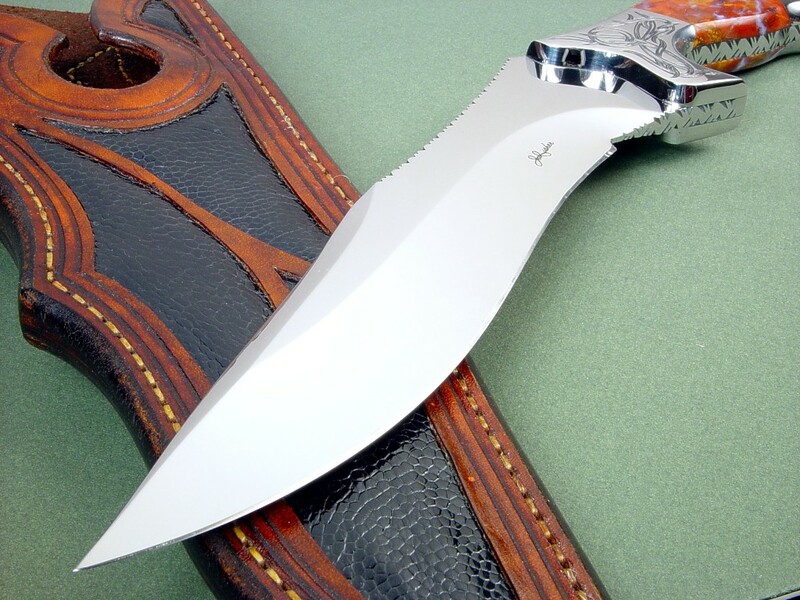 Once you have decided the type of grind you want to put into the blade you must design it and draw it on the knife so you have a simple rough guide where you specifically want your grind lines to go. The key feature that you are looking for in grind lines, is that you want them to be crisp and clean with no waves or dents. If you desire a curve, you want the curve to be level and match the curve of the blade itself. With a flat plate you must start by shaping the actual outline of the blade itself, using the leveled table for added convenience to achieve a equal 90 degree angle throughout the blade. Next you must sand the actual bevel of the blade shaving it at different angle to make a sharper cutting edge, this is the most hardest and skillful part of knife making. You must remember that belt sanding is an acquired skill and practice makes perfect. This is the most difficult part of making blades and is even trickier when making larger blades requiring even more skill, which is not recommended for beginners. By sanding smoothly from one side to the other, starting from the ricasso, which is the piece between the handle and the cutting edge. You should take your time on this part as if there is any hesitation you will dig into and that part will level higher than the rest of the level line. This can be avoided by making sure to sand smoothly from the plunge line to the tip. The next step is to grind slowly and smoothly from the edge toward the spine of the knife. Over practice and experience you will learn to naturally feel when the bevel is fully in contact with the platen. Remember thumb pressure makes the grind deeper while using your index finger moves the grind line up towards the spine. If you are looking for a more crisper plunge line move the belt of the belt sander to the edge of the platen. While a belt hanging off the edge will provide a soft plunge that is rounded. When you are finished dip the knife into the water and leave to cool before use. 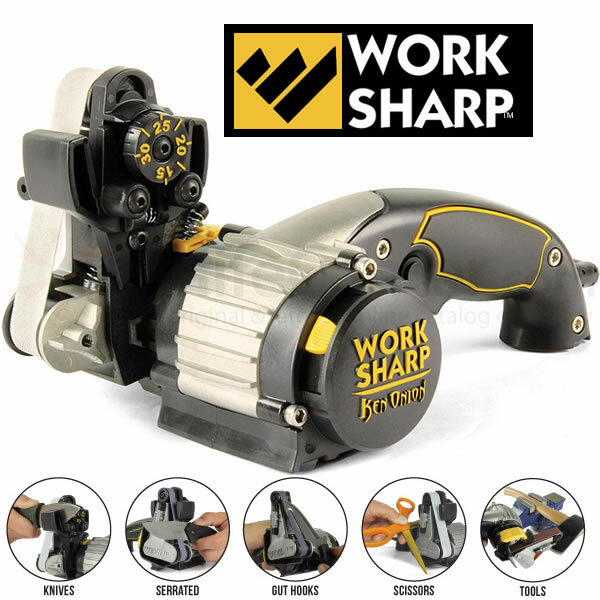 The Original Work Sharp Knife and Tool Sharpener is the first blade sharpener intended to hone each blade you claim. Utilizing adaptable rough belts, the sharpener has the capacity to sharpen straight bladed blades, as well as bended blades, tanto cutting edges, filet blades, serrated blades, gut hooks and for all intents and purposes whatever other state of the knife blade. The Knife & Tool Sharpener uses accuracy point honing advisers for guarantee that you get is the best possible edge without a doubt. Two aides are incorporated: a 50° aide for chasing and open air cuts (25° for every slant) and a 40° guide for more slender sharpened pieces of steels and kitchen cuts (20° for each incline). Expert blade creators use adaptable belts to put an extremely sharp edge on their cutting edges, and now you can have the same innovation at home to utilize at whatever time your blades get dull. You might from now have other sharpening strategies, yet at no other time has a blade sharpener possessed the capacity to rapidly and effortlessly hone this expansive scope of blades to such greatly sharp results. You are a life saver 🙂 I had been searching such tutorial for some time now. I did found a few but none of them helped as good as your tutorial did. I had already wasted seven knives trying to sand them learning from other tutorials, before I found yours. I think you should put up some short video or images to make the tutorial even more easy to understand and helpful. Thanks. Thanks. Unfortunately, I don’t keep it anymore.